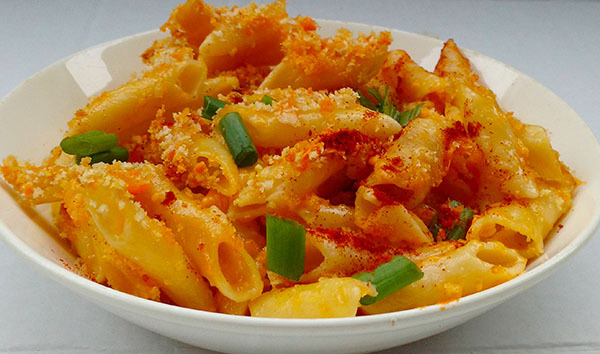 Mac & cheese isn’t exactly Caribbean, but it’s a popular comfort food. Make an ‘irie’ version jazzed up with flavours of the Caribbean. Cook pasta in large pot according to the instructions on the package. Drain and set aside. Saute the Scotch bonnet pepper and escallion in a pan until soft – 2 mins. Melt butter and whisk in the flour. Keep cook and whisking for 2 more mins. Slowly add milk in a thin stream, whisking until its incorporated. Keep cooking and whisking, until the sauce begins to thicken. About 5 mins. Remove pot from the stove and add the sautéed pepper, escallion, spices, molasses, lime and oil. Mix together and adjust seasonings to taste. Stir in half the cheese until it melts. Add cooked pasta to the pot and mix to combine. Pour the macaroni and cheese into a greased baking dish and sprinkle remaining cheese on top. Bake at 350 degree F for 20 mins. Remove from the oven and rest for 10 mins. before serving. Garnish mac and cheese with remaining escallion, if desired.